Over a decade ago, we created the Fearless Presentations® class to help people eliminate public speaking fear. After training thousands of class members, our instructors have discovered a few simple truths about stage fright that, once you understand them, can help you really reduce this fear. Below are are a few facts about public speaking fear that can help. What Is Public Speaking Fear? What is the fear of public speaking? Stage fright is still one of the most prevalent anxieties in the world, and as a result, people often have questions about why it's there, where it came from, and how do you get rid of it? Most people who feel this fear feel like they are the only ones out there who experience the butterflies in the stomach or shaky hands, but in reality, just about every speaker has some sort of nervousness when presenting in front of groups. In fact, a great deal of people feel that the stage fright is so great that they avoid public speaking situations all together and miss out on big opportunities. If speakers don't do something about the anxiety, it can escalate and turn into a debilitating phobia. Where Does Public Speaking Fear Come From? Anytime a person tries something for the first time, he or she will feel nervousness or anxiety about it. Remember back when you got on a bicycle for the first time? Or the first time you tried to drive on the freeway? The reason why we tend to remember situations like riding a bike or driving a car for the first time is because in those situations, we felt an imminent threat to our safety. But to a lesser extent, we feel this nervousness constantly when we try something new. For instance, when I got my first Smart Phone, and I went to the App Store, I was really nervous about downloading that very first "Free App" because I was scared to death that I'd end up with a recurring charge on my phone bill that I'd never be able to get rid of. I felt the same way the first time I entered a credit card number into a website form. Nervousness is normal when we try something new. The more imminent the threat to our safety, the more nerve-racking the activity will be. For instance, my heart beat a lot faster when the first time I went bungee jumping than it did the first time than when I bought a book on Amazon. Public speaking is a skill just like any other in that the first time you do it, you will feel nervous. The threat of "failure" is fairly imminent because we are often speaking in front of our peers, and the esteem from these peers is very important to us. If we do well, our confidence grows. If we have a challenge, our stage fright will grow. Often, this fear is created in school as we grow up. I've had hundreds of people attend my public speaking class and tell me that they've ALWAYS had this nervousness. They've told me of that time in 1st grade when they had the singing recital solo and their voice cracked, or when they were standing in front of class doing the math problem and choked, or that time they had to give the book report and they sped right through the entire presentation at 100 MPH. Because of these early situations, when we stand up in front of our business peers and speak, even if we do okay or fairly well, we'll often consider it to be a failure. The more this happens, the more nervous we will be in future speeches. Many times we might be performing well in our business speech, but if we just THINK that we did poorly, the anxiety will show up as well. If Your Stage Fright Doesn't Reduce Over Time... Change What You are Doing! The nervousness is normal when you begin to speak, but if it remains over time (or gets worse), you're not growing. Try changing what you are doing. For instance, if you've been driving for years, and you're still terrified to drive on the freeway, the process that you have gone through to grow confidence has been interrupted. "Wait, that's absurd! No one can drive for 15 years and not gain confidence. Over time driving becomes second-nature." Well, only if that new driver continues to practice and grow. If he/she avoids driving and only drives once, maybe twice a year, that fear may remain and even grow more intense over time. The same thing happens with speakers. Instead of practicing, we often avoid opportunities. In other cases, we use crutches to make us feel more comfortable. The way that most people prepare for a speech actually adds to nervousness versus reducing it. Here are a few of the common things that people do to try to reduce stage fright but that actually CAUSES FEAR. Starting with the PowerPoint slideshow: PowerPoint slides are visual aids for the audience -- not cheat notes to remember what you're going to say next. When a presenter starts by creating the PowerPoint deck, he/she will likely create a speak-click-speak-click-speak-click presentation that will be pretty boring. Once it starts to go poorly, the nervousness will increase even more. In Fearless Presentations®, we help participants prepare what they want to say first, and then help them design visual aids that made delivering the presentation much easier. Trying to Memorize a Speech: When a presenter tries to memorize a speech word-for-word and rehearse timings, a number of things can occur that actually cause the nervousness to increase. Things like, forgetting part of the speech, speaking to fast and running short of material or speaking to slow and running out of time, and not to mention the time and effort that trying to memorize a speech takes. Frustration will often set in, and the confidence of the presenter can be harmed. In Fearless Presentations®, we show presenters a very simple step-by-step process to design a speech where the presenter can adjust the timing at will if the requested length of the speech changes at the last minute. Over Rehearsing: We suggest that a presenter rehearse a "well designed" speech once, maybe twice, and then deliver the presentation. Over-Rehearsing can cause a present to slip into the Memorizing the Speech pitfall. Relying on Notes: Presenters often fill more comfortable initially if they have the crutch of prepared notes in front of them. However, public speaking is a communication between the speaker and the audience, so when the speaker's attention is constantly being diverted to the notes in front of him/her, that connection, the rapport, is broken. It just makes the speaker more nervous. Listening to Well Intentioned Co-Workers or Friends: When we feel uncomfortable, we might turn to a friend or coworker for coaching. The challenge with this is that most people are very quick to pick up on mistakes, but not so quick to pick up on successes. Remember how above we talked about how success lead to confidence and failures lead to nervousness? Well, our friends and coworkers will often tell us all of our mistakes so that we can correct them. So we end our coaching session with a series of perceived failures. When we stand up to speak, if we catch ourselves doing some of these things, we often panic. A trained public speaking coach helps the presenter do a good job the first time and then builds on successes. This technique works much faster (and more comfortably) than the "wait until someone fails and then tell them about it" technique. So, some public speaking fear comes from (1) childhood memories, some comes from (2) past challenges speaking in the business-world, and some comes from (3) faulty preparation. Fearless Presentations® helps each presenter have a series of public speaking successes by changing the way that we PREPARE for a presentation. Our step-by-step process makes writing and delivering presentations much easier. Once you have a series of success after success after success with zero failures in between, the anxiety fades away... just like it faded after a few successes driving your car. How do you overcome the fear of public speaking? Public speaking fear is just like any other anxiety in that the more that is unknown or the bigger the threat, the greater the nervousness that we experience from it. So if we lower that risk, lower the unknown factors, and lower the threat, the fear diminishes and sometimes even goes away entirely. Anytime we do something somewhat dangerous, we feel the heart pounding and queasy stomach. Things like riding a bike, driving a car, flying in an airplane, or firing a handgun are all somewhat dangerous for people without any experience doing these things. If you've ever seen a four or five year old kid riding a bike, you can typically see the tension in the kid's face. It's the same with a teenager with a driver's permit. That very first time that your plane took off and you felt that tickle in your stomach, you likely grabbed the arm rests a little tighter. And police officers practice day after day to get proficient at firing their handguns because they want to be extremely confident. First, Start with an Attitude of Want: You have to want the skill that is being developed. You don't have to have a lot of confidence in the beginning, but you often do have to have a bit of courage. Courage with success leads to confidence. Second, Break the Activity into Component Parts: Most people try to complete an entire activity flawlessly all at once, but if a mistake is made in the process, fear develops. It's easier to grow in a step-by-step manner. Third, Master the Component Part: Practice each component until confidence in that specific part grows. String a series of these successes together, and the self-confidence in that overall skill grows as well. Repeat the Process: As a person masters a component part of a process, confidence grows. It becomes much easier to practice the next part... and the next. The speed at which we pick up new skill in the area increases as well. It's like a snowball in that it's a little challenging to get started, but as you roll it over and over, it gets bigger more quickly. 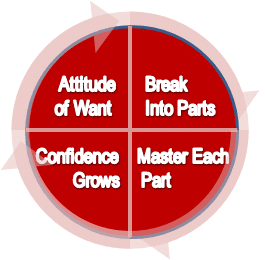 One of the interesting things that happens is that once we go through this cycle once, the first phase, The Attitude of Want, is much easier to move through because we've already had a success. As we complete the process over and over having a success each time, the fear that originally kept us from moving through the first phase decreases dramatically. A couple of days ago, I took my kids to a fast-food place. It was pretty busy, so I jumped in the shortest line. When I got to the front of the line, I gave the young person my order, and I could tell by the look in her eyes that something I had said had confused her. She looked down at her screen and started searching for the item that I had mentioned. My first impression of her kicked in, and it was "Wait a minute... something is wrong her." I watched her finger searching the electronic menu, I could see it tremble a little. I changed my impression to "Ahhh... must be a trainee." Immediately after drawing that conclusion, I glanced at her name tag, and there it was... Trainee in small letters under her name. (By the way, she gave us great service and did a great job, but that is not the point.) The point is that her self-consciousness caused her to question herself. When she questioned herself, she showed nervousness. The nervousness came across to me as her not being that good at working the cash register, yet. 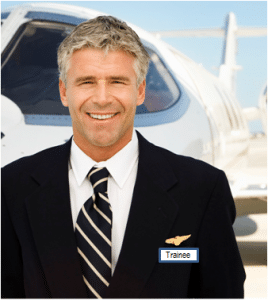 Do you want to give the perception to people that you are a Trainee or that you are the Professional? To be the professional, you want to exude self-confidence when you present to groups, speak to individuals in a one-on-one fashion, and when you lead people. That way, the outside appearance matches the inside competence. To overcome public speaking fear, break the skill into component parts and master each part. Fearless Presentations® helps each presenter have a series of public speaking successes by changing the way that we PREPARE for a presentation. Our step-by-step process makes writing and delivering presentations much easier. Once you have a series of success after success after success with zero failures in between, the fear of public speaking fades away... just like the fear of driving on the freeway faded after a few successes. For more information, call us toll-free at 1-800-975-6151 or complete the form below.